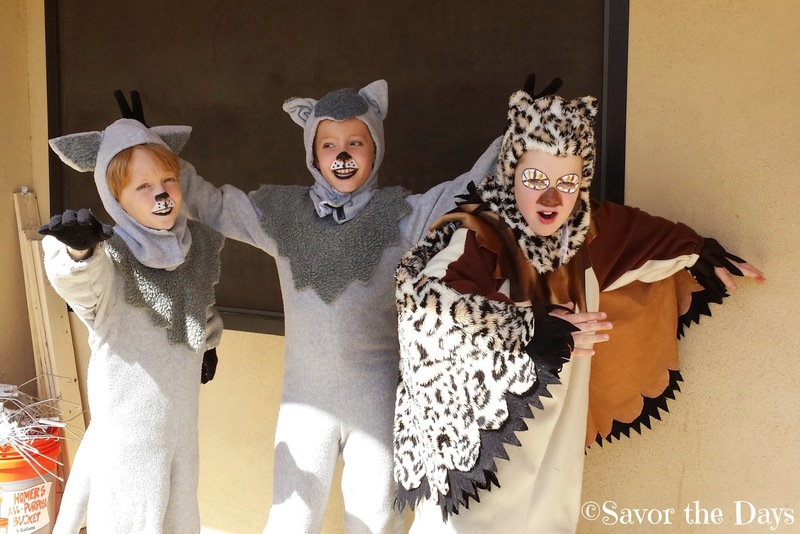 Nicholas just finished four shows for opening weekend of Narnia (adapted from the book, The Lion, the Witch, and the Wardrobe by C.S. Lewis) at the Actors Conservatory Theatre (aka "The ACT"). The show runs for 2 weekends and each weekend has four shows: Friday 7:00, Saturday 2:00 and 7:00, and Sunday 2:00. Friday's opening night was a sell out and the rest of the shows either sold out or had only single seats still available. Once he is in full costume, he gets in line for makeup. This is the only part of theater that he dislikes. There are so many kids needing detailed makeup for this show that there are actually two stations he has to goes to. First, everyone gets eye liner to make their eyes "pop". Next he sits for his special owl makeup. He will sit with the same makeup person each time. However, she said that there are lots of options to try different looks so they might experiment a little for the first few shows to see what looks best on him. But even if this lady isn't there, his basic makeup design is drawn out so that someone else could easily create the same look. And here is the little owl all ready to go. 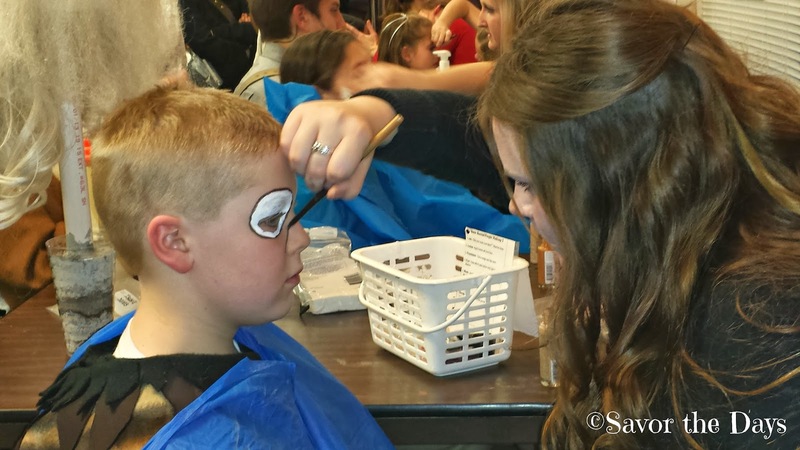 I spent most of my time during the show down in the Greenroom helping the kids with their costumes, makeup, and making sure their heard the call to line up to go on stage for their scene. 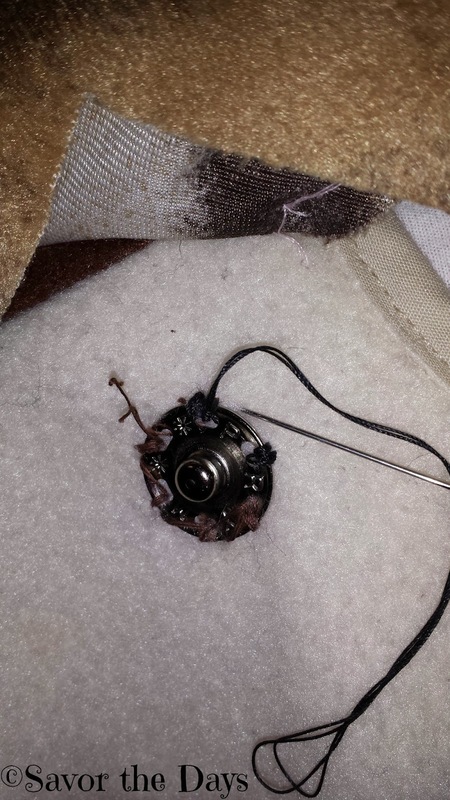 I had to take a picture of this to show Stuart that I even did some sewing (after the costuming lady tied the starting knot for me and then told me how to tie it off once I finished the repair)! The kids are having so much fun in their costumes! This time Nicholas had brown and yellow eyes instead of just brown like he had on opening night. He said it looks even cooler this way. This show has the largest cast ever in the history of this theater. There are 105 kids plus 4 adults! They all get ready for the show in the Greenroom and this is where they hang out until it is time for them to head upstairs for their part on stage. Typically they bring personal items and activities in a small bag that they just leave along the wall when they aren't using them. But with 105 kids, there would be bags everywhere. I love the creative way that the theater came up with to get the bags up off the floor and keep things more organized. 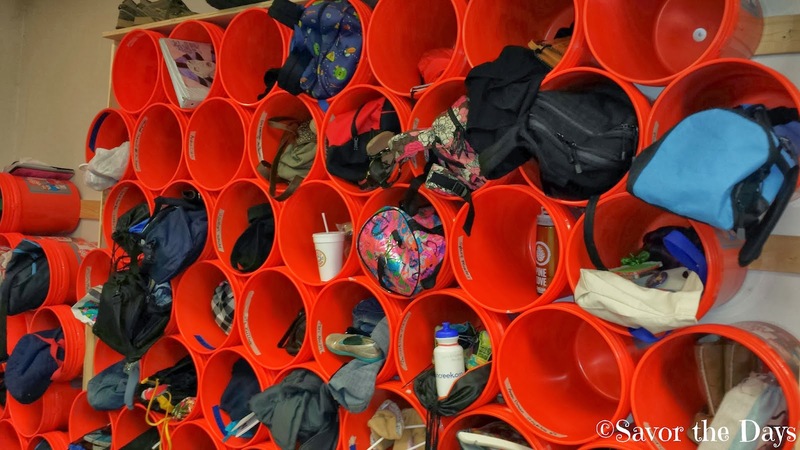 Check out these orange storage bins! They attached some 2x4 pieces of lumber horizontally to the wall then screwed in 105 orange Home Depot buckets into the lumber to secure them to the wall. Cheap and effective storage bins that were put up rather quickly. I love this idea and can see this working at home in the garage or a kid's room. 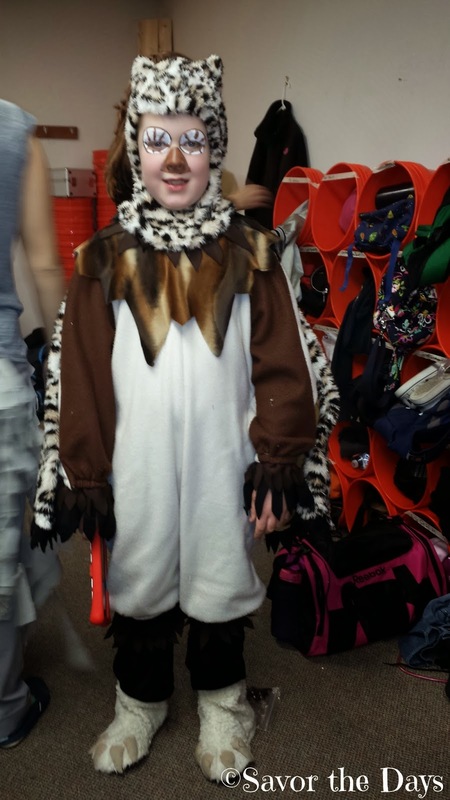 Rachel used her tablet to take some pictures of kids in their costumes. For the last play, she had a big crush on one of the older boys. This time she doesn't seem so enamored with him anymore. But she was looking at this guy in the wolf costume a lot. I even saw her trying to take pictures of him with her tablet! 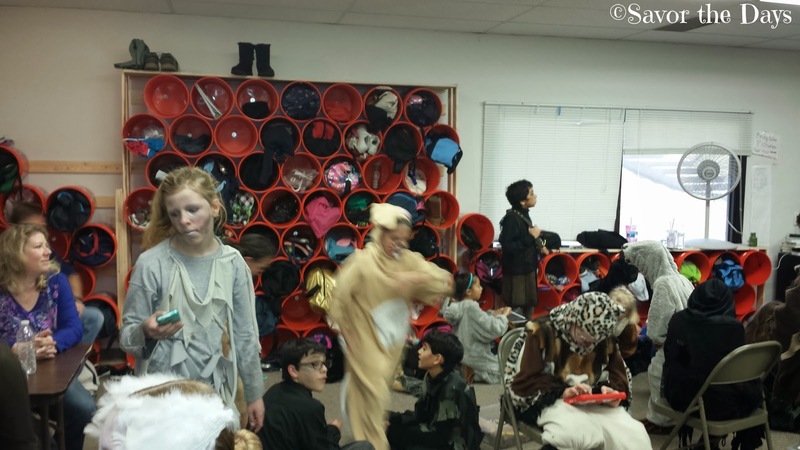 Since this particular theater is a small community theater, parents volunteer their time to make props, sets, and costumes. Here is my pick for the most creative costume. She is a hedgehog in a basic brown felt costume with hundreds of brown plastic coffee stirrers hot glued to her back side. Isn't that just such a creative way to create this look! Just before the kids go on stage, they do warm ups. They do a few movements to get their blood pumping and they do some singing exercises and they may go through a few parts of their songs. Here is a quick video of them singing one of their big chorus songs, "Cair Paravel". Cair Paravel is the fictional castle where the Kings and Queens of Narnia rule. If you are reading this post on email you will have to click through to watch the videos. When warm ups are done, everyone says the Actors Prayer. I love this part! Curtain coins are given to the cast and crew for doing a good job during the performances. We had a little Valentine's Day party after rehearsal one night and one of the dads who was building the sleigh said something about wishing he could take a break to go get some cookies so Rachel brought him a little plate of treats to enjoy while he worked. 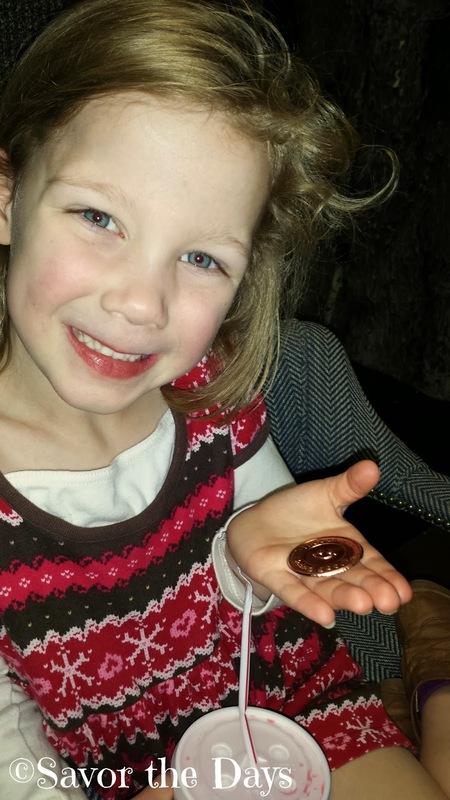 He told her he would give her a curtain coin later and she has been asking me about it ever since. She was so excited to finally get it! She can use it to buy a treat at the concession stand. The ACT puts on some amazing productions but it is also a great experience for the kids. Nicholas is more comfortable speaking in front of a group and he is learning so many wonderful aspects of theater. Plus we've all made some wonderful friends during the two shows Nicholas has performed in. There is a lot of work involved to make it all happen though - both for the actors as well as the parent volunteers making all the props and costumes. But it is so worth it! The next performance will be Flat Stanley and it will actually be a travelling show with performances at local public schools. Because of the need for a small cast, it will be a tough audition and only open to kids age 10 and over. Nicholas will still be 9 so he can't audition but he is looking forward to May when he gets to audition for their summer show, The Hobbit! The Actors Conservatory Theater is located at 1720 S. Edmonds Lane in Lewisville, TX. For more information, please check out their website at www.getintotheact.org.